We know. The last thing you need is another delectable sugary indulgence to have to say “no” to. But who would we be if we didn’t share our latest discoveries, sweets or any other kind? And while we love Halloween just like the next girl, these treats will satisfy our sweet tooth year-round. From melt-in-your-mouth cinnamon rolls, to chocolate-covered pretzels topped with toffee bits, to pecan coconut bars, this batch of gourmet goodies makes the perfect hostess gift, party dessert, or personal stash. So whether you give, serve, or hoard them, our top 5 sweets picks will have everyone smiling. Fretzels take chocolate-covered pretzels to a whole new—gourmet—level. As if this salty-sweet treat weren’t perfect enough, wait until you taste it covered in toppings such as M&Ms, peanut butter chips, or buttery toffee bits. Converts can join the Fretzel of the Month Club for new specialty flavors year-round. Forget about the worm . . . Early birds will score big getting to Brooklyn-based Ivy Bakery at first light, before the daily batch of out-of-this-world cinnamon rolls is gone. We’re obsessed with the original—light dough twirled with cinnamon and doused in glaze. For a fall flavor kick, try pumpkin spice or caramel apple variety. Not in the New York area? No worries. Ivy ships many of its 300-plus other treats anywhere in the U.S.
It’s not easy to buy something to eat that’s as good—or better—than homemade. But Lisa’s Cookie Shop, started by Lisa Ciriello, combines crowd-pleasing recipes and superior ingredients for cookies and bars that have us licking the crumbs off our fingers. From chocolate-chip cookies to raspberry bars to the best-selling Kitchen Sink Cookies, these goodies will make you feel as if you’ve landed back in grandma’s kitchen. It’s indulgence time. Which way do you go? Cookie, candy. Candy, cookie. How excited were we to solve this dessert dilemma when we stumbled upon Gourmetibles. These wafer-thin cookies come slathered in butterscotch, dark chocolate, or peanut butter, and sprinkled with toppings such as almonds, walnuts, or marshmallows! For the serious sugar addict, try More than S’Mores or Pep’Mint Power, and for that salty-sweet fix, go with PB and Pretzel. When popcorn goes sweet, we go wild. And you will too with Garrett’s addictive popcorn, in flavors such as cashew, almond, or pecan. 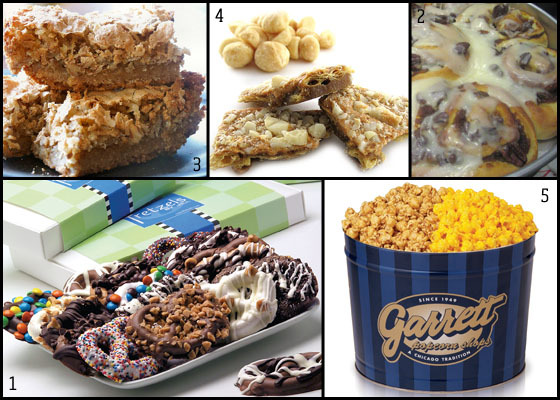 Don’t miss Garrett’s CarmelCrisp & CheeseCorn combination tin for a full blast of the two most popular flavors. Whether you snack on them together or separately, this savory-sweet popcorn mix will leave you wanting more. For more on the PageDaily team’s snacking obsession, read Editor-in-Chief Nancy Rotenier’s blog post, The Food Police Fesses Up: My Snacking Confession. OMG>>>>>over the top yet delicious and made with love!! !